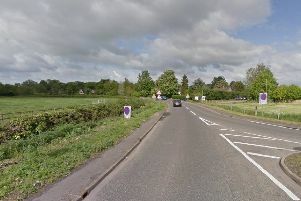 A serious crash involving a lorry and a van is blocking part of the A1M near Peterborough today, Friday September 22. The crash has taken place at 11.33am near junction 15 for Sawtry on the northbound carriageway. Police and ambulance crews are at the scene of the crash which has seen the van overturn after a collision with a car transporter. Details of injuries are not yet available but two lanes of the carriageway are closed. Motorists are advised to avoid as queues are building in the area.